It is generally accepted that the town of Mesilla was founded some time in the late 1840s, although it had been visited by various European travelers since the mid-1500s. Of course, Native Americans were familiar with this area and had camped here for thousands of years. They were not pleased to see settlers. In 1851, Fort Fillmore was established to protect Mesilla from raids by Apaches. 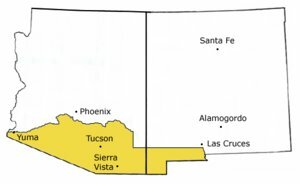 In 1854, The Gadsden Purchase made Mesilla officially part of the United States. The treaty is named after the person who represented the United States in the negotiations with Mexico, James Gadsden. With this treaty, Mexico sold the United States approximately 29,000 square miles of land for $10 million. The map shows the location of the Purchase. You can read the actual treaty here. Today Mesilla has a population of about 2400.